While this will be a short post, it’s one I feel obligated to share because: cats. Everybody loves cats. My two favorite things happened: I took adorable photos of my mittens yesterday AND it’s #monsteramonday. Not to mention, Urban Jungle Bloggers’ feed is all about Tropicool Summer. What’s more tropical/cool then cats relaxing in the sun? Harvey and Harlequinn were all sssuuunndaazzee on Sunday, enjoying the warm sunshine. 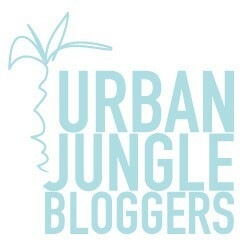 As some of you may know, I love the Urban Jungle Bloggers features that they put out every month. For Tropicool, I visualized a whole scene of a styled shoot, with beach umbrellas and margaritas. Really, these photos are way more truthful to my Sunday mood in reality. 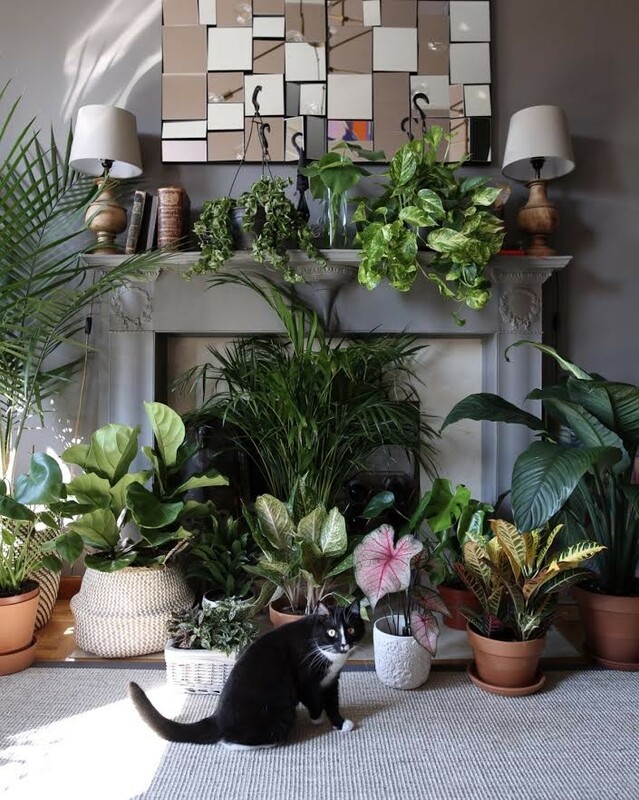 If you own a cat (or dog, I’m sure this doesn’t just apply to cats…), have you noticed they enjoy your houseplants as much as you do? Yes, they are jungle-y, and they can be fun to eat. 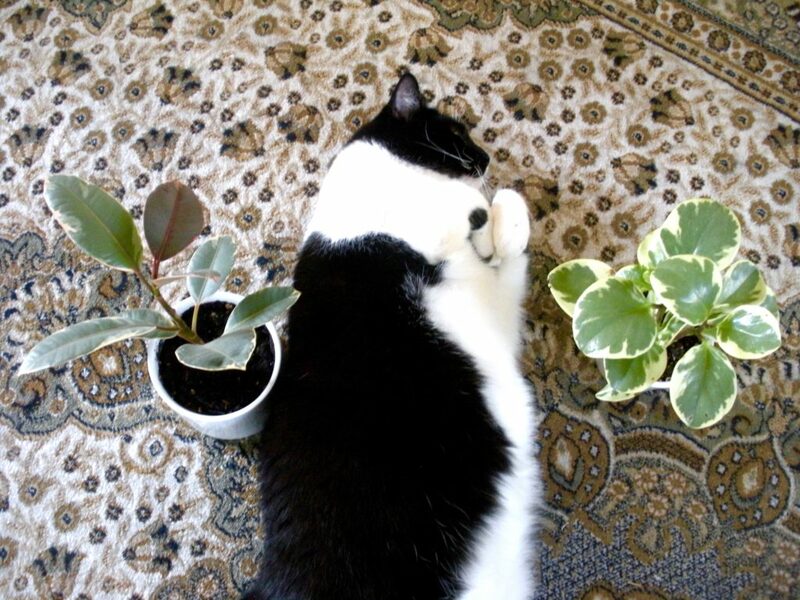 But since acquiring more houseplants, my cats seek them out, nap beneath them, and enjoy their company. 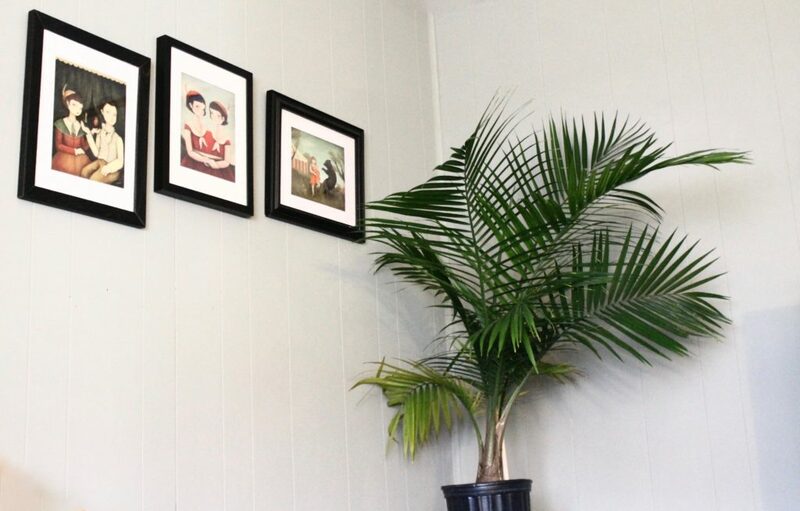 That’s also why, despite this being a pet-friendly blog, I suggest incorporating large leaf plants in your home. 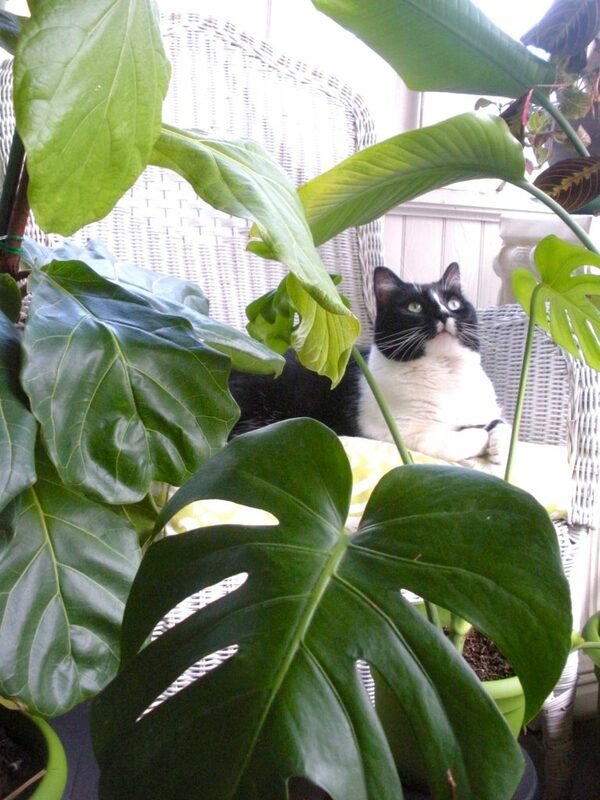 I know they can be dangerous if ingested, but I never have had a problem with either kitty eating my Monstera or Rubber Tree. I keep my medium-sized lush plants on petals a lot of the time, especially my palm, which cats love to eat. 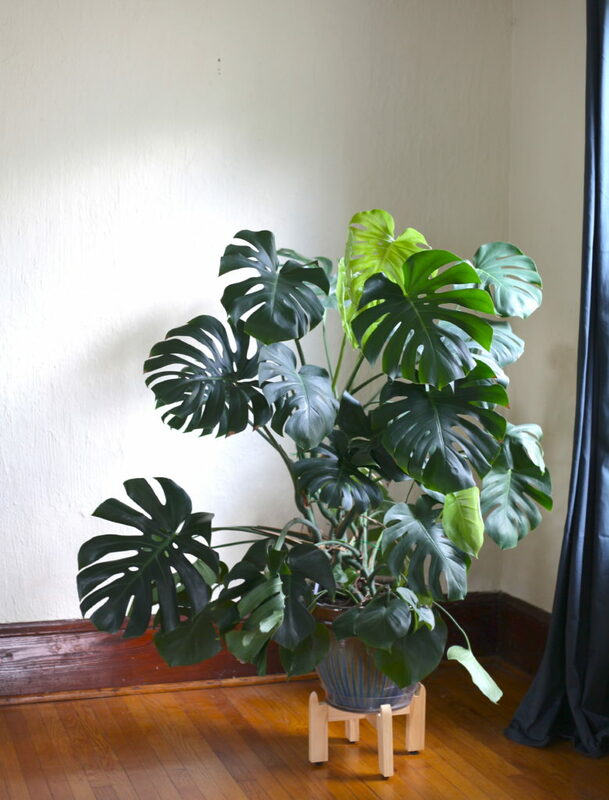 My Monstera and Rubber trees are in floor planters near windows. 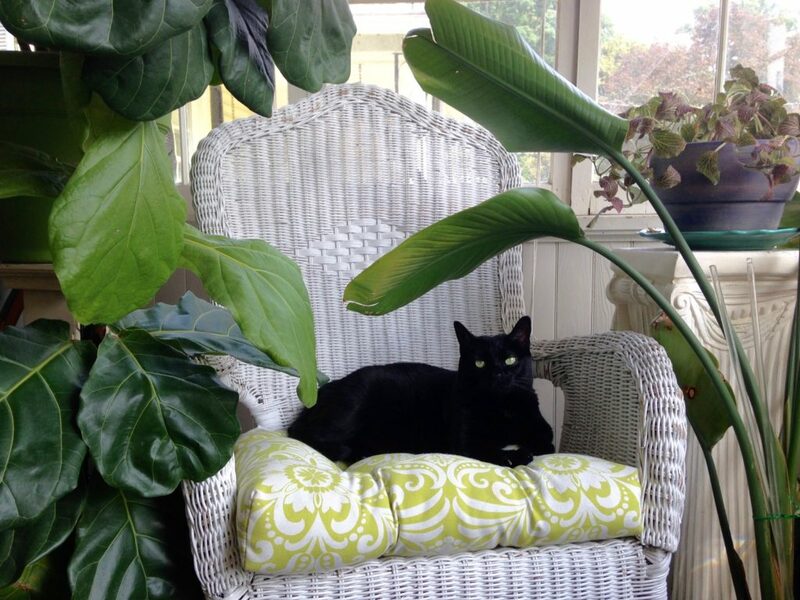 I typically move everyone to the porch in summer where the humidity is high and put comfy cat-friendly cushions on my wicker chairs. The plants love the moisture in the air and the kitties love the sun, heat, and general sauna atmosphere, despite being covered in fur. 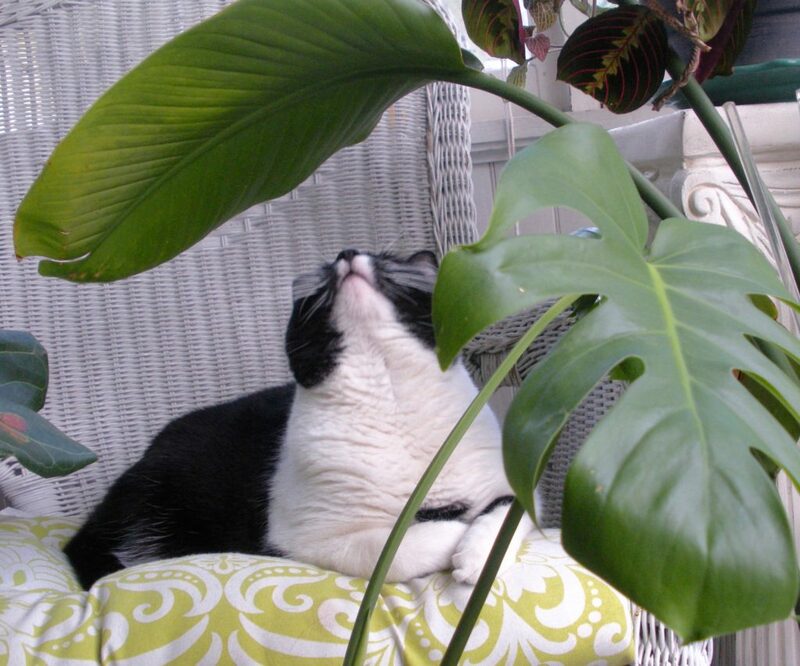 Especially for indoor cats, the greenery, increased oxygen, and air cleaning effects plants have are all beneficial to keeping them healthy. A bunch of fresh catnip in a pretty pot helps, too. Speaking of which, I actually like this article from The Spruce. Not a plant mom yet? 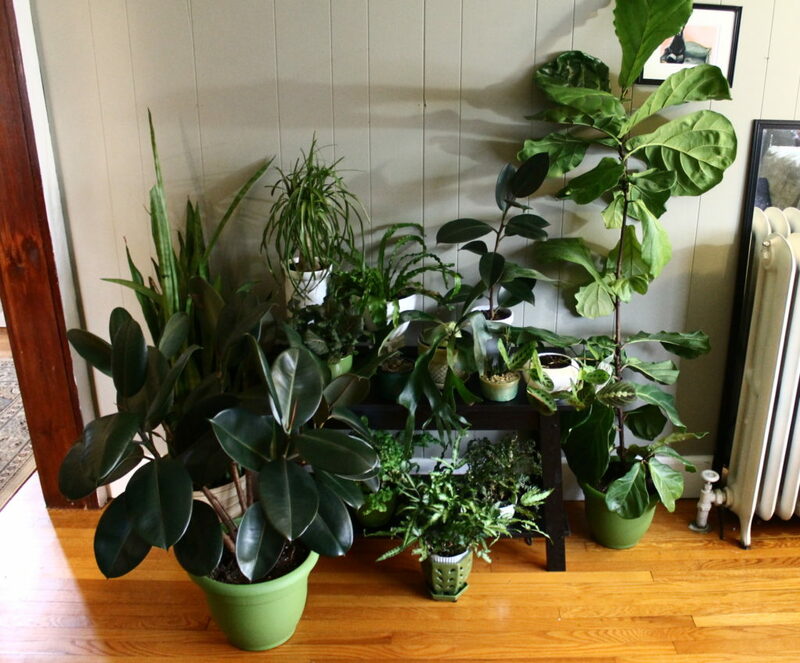 Check out this blog for pet friendly plants to get you started, you’ll be happy you did! Soon, you can have you own tropicool oasis. Thank you for getting back to me on this. I realized it was a misspelled *dog tree was supposed to be *fig tree..
Hi there, a quick question: I was about to buy a large (6ft.) fig plant – you have it in the picture above as well, but realized that it was not safe for cats. I own an indoor cat who is 15 yrs old and she actually never expressed interest in eating any of the plants. Is being near such plants dangerous enough? Really like the indoor dog tree, but I love my cat more. Any thoughts? 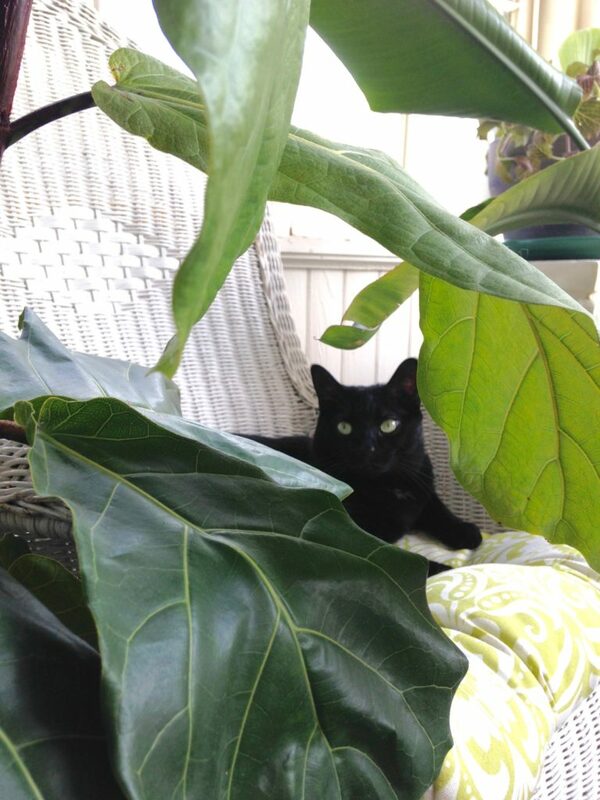 Hi Katerina – I have not had any issues with my cats even interested in my fiddle leaf fig. Especially with it being so tall, and as long as your cat is not a climber, I would say you are absolutely fine. Like I caution all pet/plant owners, monitor your cat when you first bring home your fig. Good luck! Hi there! 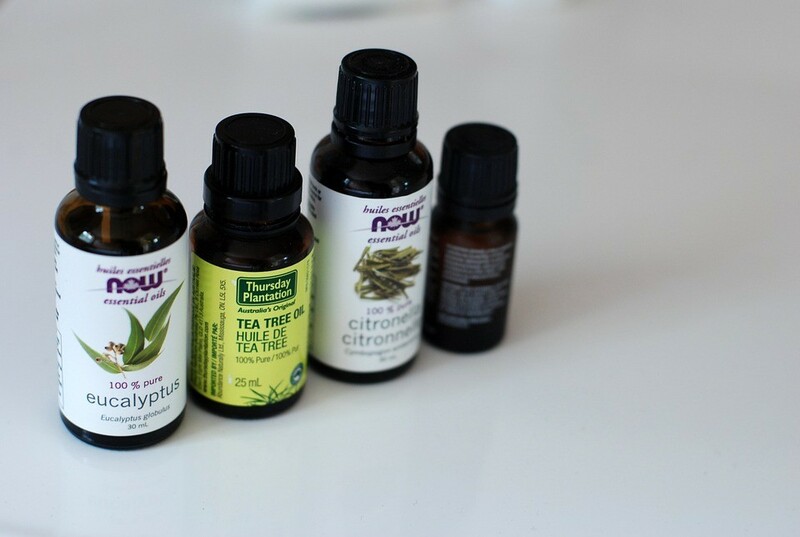 I sill love checking out your blog 🙂 I’m hoping you can answer a question for me: Crispy Wave plant (aka Japanese asplenium nidus fern) – yea or nay? I can’t seem to find anything out about it online. I bought it anyway, and it’s beautiful, but my kitties are already poking around it so I’m looking to confirm that it’s safe! Thanks! Awesome, mine have gotten over their curiosity as well, but I just need to be sure 🙂 Thanks again!